It was just about a year and a half ago we were reporting that Carnival Corp had acquired seven acres outside Amsterdam in the Dutch town of Almere for a new training facility. Now we can report that the state-of-the-art facility is just about ready to open - and it will have a new name. The US Coast Guard is searching an area of the Gulf of Mexico 195 off the coast of Galveston where a 33-year-old woman went overboard from Carnival Liberty early Friday morning. Royal Caribbean took delivery of the 227,000-ton Harmony of the Seas from STX France today at Saint Nazaire (France), and Harmony officially became the largest cruise ship in the world. 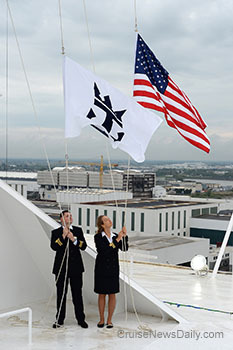 The flag-changing signified the ship's handover. 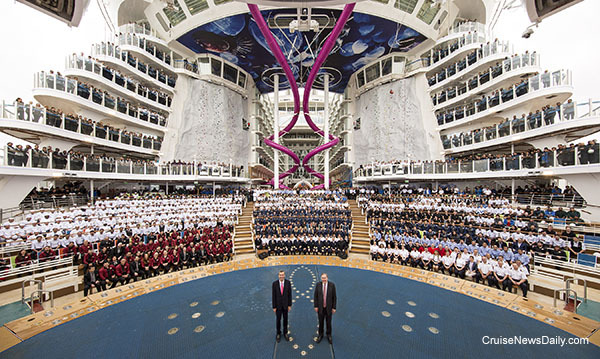 At the handover, the 2,100 crew members sat for a portrait. 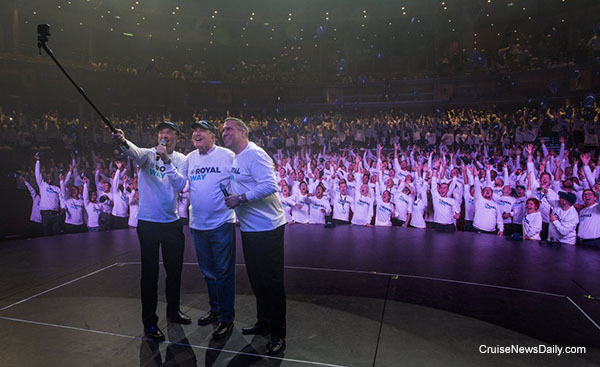 The day before at a rally, the crew posed for a selfie with Richard Fain. Yesterday we reported that Crystal contracted for a total of eight new ships (including six river vessels) with the Lloyd Werft Group of yards. 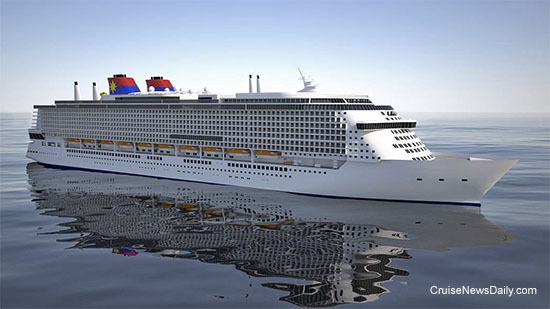 Parent company (of both Crystal and Lloyd Werft) Genting Hong Kong also had another order up their sleeve. At the same time, they ordered two additional ships from Lloyd for their Star Cruise brand. With them, it seems Star is being positioned to make an impact both in the Chinese market and the global cruise industry. The two ships ordered from Lloyd Werft are the first of a class which Star is calling “Global Class” and are sized at a whopping 201,000 gross tons with 5,000 lower berths. Rendering courtesy of Genting Hong Kong. All rights reserved. May not be copied or used without express permission. 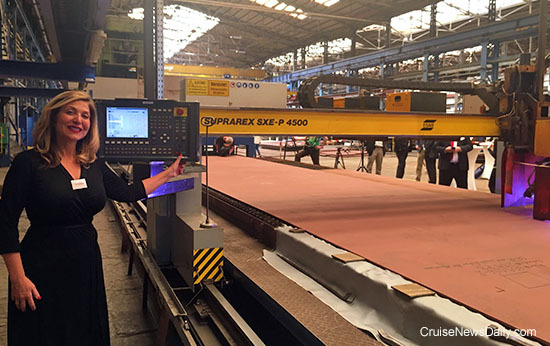 Crystal has had two days in Germany that were all about shipbuilding. The line finalized orders for eight (yes, eight!) ships with their sister company, the Lloyd Werft Group, and witnessed the cutting of the first steel for their river ships. Royal Caribbean is selling a majority stake in their Spanish Pullmantur brand and French brand, Croisieres de France (CDF). RCCL will retain 49%, partnering with Springwater Capital. Some cruise lines name a ship and it’s rather businesslike and to the point. Others, well, they consider it a time of great celebration and pull out all the stops. The latter was the case in Hamburg on Saturday night. 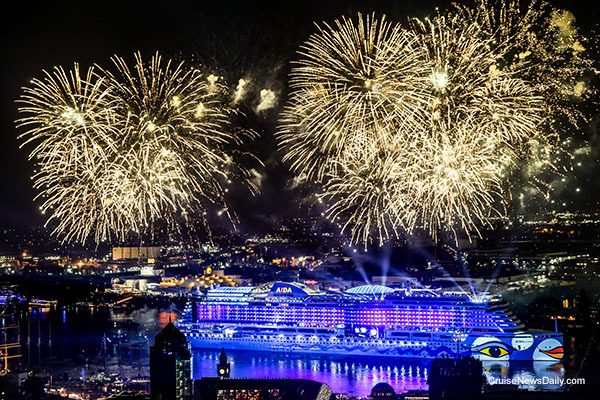 Carnival’s German brand AIDA was given the opportunity to make the christening of AIDAprima the centerpiece event at the celebration of the 827th anniversary of Hamburg’s port, and they took full advantage of it. 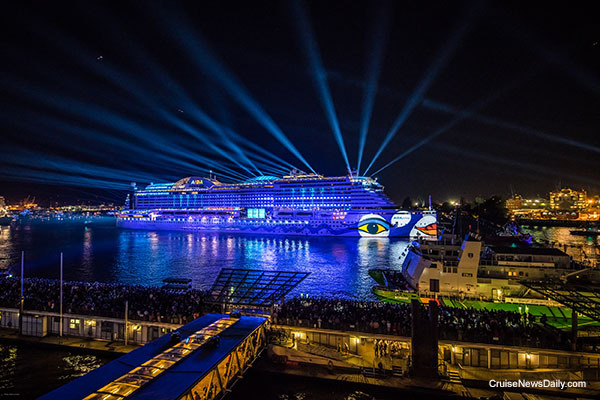 With 1.6 million people in attendance at celebration, AIDA gave them a popular German actress as the godmother, a brand-new large ship, a laser show and gigantic fireworks display. Carnival Pride struck an elevated gangway in Baltimore resulting in minor damage to the ship but the gangway and three vehicles parked under it were more or less destroyed. Carnival Valor returned to service after a two-week dry dock with new dining and bar venues. 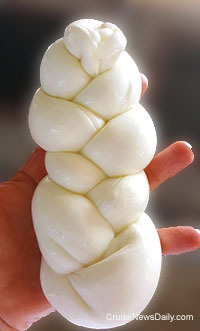 The first of Costa's gourmet fresh mozzarella bars went into service aboard Costa Diadema. Photo courtesy of Costa Crociere. All right reserved. May not be copied or used without express permission.